Most people can't dedicate 100% of their time to playing League of Legends, and even those who do have trouble keeping up with the multitude of champion already available, much less all of them that Riot releases. Have some transferable skills to other champions. Of course, if they're also very strong that's a plus, but with all the nerfs and buffs each patch it's hard to ensure that. I'm a big fan of Pantheon. His strategy is very straight-forward, yet exceedingly effective. First you harass the daylights out of your enemy laner, whether it be top, mid, or support. Then you proceed to roam once you hit six for some sweet double kills. The best part is, the majority of his stuff is all point-and-click, so if you mess something up, it's mostly your fault. He's rarely banned and still does very well in solo queue, meaning that if you're a Pantheon main, getting to play him is never a problem. Even if you don't get him, his animation cancelling skills you learn as a Pantheon main are easily transferable to someone like Jarvan IV and is still very effective. If you ever get auto-filled as jungler, he can still perform the role well via early game stuns and mid-game roams. Meanwhile, if your friends want to play some Twisted Treeline, he absolutely crushes that map. All-in-all, I'm a little jealous of Pantheon mains. Jarvan mains are no strangers to the nerf bat since his team fighting powers synergize incredibly well with champions like Gnar to royally piss players off. 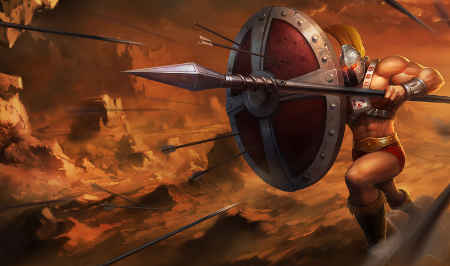 However, Jarvan is just as versatilee as Pantheon if not more so (watch out for that J4 + Leona bot lane combo). His double gap-closer is incredibly potent, and if you can't last-hit with his oh-so-satisfying passive, you basically can't last-hit with any champion. Gragas isn't particularly easy to play, but he's just as versatile as Jarvan and Pantheon and can play as a top, mid, jungler, and support. The interesting part about Gragas is that even as his skills have evolved over the years, he continues to keep coming back around as an extremely effective champion simply because of his ultimate utility. It definitely takes some time to master this guy and he's continuously targeted for nerfs, but right now he's fairly balanced and if you love playing him, he's rarely banned. I'd never take the time to seriously sit down and learn him, but sometimes I wish I did. Kayle is by far the ultimate cheese champion. There are few people who understand truly demoralizing your opponents the way Kayle mains do. The best part is, nobody really actually understands her damage except Kayle mains, which means enemies are always going "WTF" when they die. Everyone knows that her ultimate blocks all damage, but it's really the sheer scaling on her items that makes her unbearably strong. If you've ever heard a Kayle main say, "once I get Guinsoo's GG" and proceed to GG 1v5 the enemy team as a 0-5 Kayle, you know what I mean. Lastly, even though she's generally played top or mid, she can cover any position if you're good enough on her, and once she gets her items up, she's still the same ol' Kayle. Kennen is another one of those 1v5 champions that's extremely versatile and playable in every role except jungle. Kennen mains make me want to instalock Janna every game, only to discover we're up against an AD Kennen and my ultimate isn't going to turn the tide. Again, a rarely banned champion that's still very effective, climbing the ladder as a Kennen one trick pony is certainly very feasible and I've seen quite a few of them. This man of metal is Kayle's melee twin. Nobody really understands what he does except Mordekaiser mains, only that you shouldn't let him get dragon and don't let your ADC die with Morde's ultimate on him. Similar to Kayle, you might hear an 0-5 Morde main say, "let's get dragon, then they're screwed" and suddenly discover that after you get dragon, they really are screwed. He's generally played top or mid, but the ol' Mordekaiser + Blitzcrank bottom and Mordekaiser jungle can still do well. Don't bench the Kench. He's still got that one extremely useful, yet highly experience prone Devour at his disposal. Late game he's virtually unkillable, and can play as a top or support very easily. Meanwhile, he's still played a great deal as a jungler in 3s, leading me to think his lack of 5s jungle presence is just some sheeping action. The newest Galio rework allows players to enjoy him in every lane except as a marksman (can't say it hasn't been tried though). Although he seems most viable as a top laner now, he can certainly fill the other roles if you set your mind to it, and his utility is still the same. Quinn's probably the only Marksman-type that can fulfill four roles other than Urgot, but hey Urgot's not a real champ anymore right? If you're a Quinn player, you know that even during that rare time where you lose lane, roaming can get you right back into the picture. Meanwhile, she dominates lanes similar to the way Kayle does, with level two power spikes controlling the flow of the game. Ever since the lethality nerfs she's largely flying under the radar, but still sporting a pretty decent win rate across her roles. If you're a Quinn main, I'd say keep on soaring. Technically Jayce is only a top laner and a mid laner, but his role versatility is really in his strategy. He can be a long distance poker, bruiser, split-pusher, and tower crusher, all without changing his core build. This makes him incredibly good in almost every situation, especially if he manages to dominate his lane first. Fizz and Zac are very versatile, but are banned far too often for me to consider them playable. Meanwhile, Cho'Gath is just so rarely played in this high mobility meta that I've left him off this list for now. That could change with Riot's multitude of reworks though, so stay tuned! Got a champion you want to talk about that I left off the list? Found a new main? Comment below!